If first time around, the prison framework threw up fresh textual insights, this one works even more forcibly in a shortened two hour version of Henry IV parts 1 & 2 – a condensing that dates as far back as 1622 (by a certain Sir Edward Dering) but has only occasionally been attempted in the 20th century, notably by Orson Welles in a five hour version and the RSC’s John Barton in 1969. John Caird also produced a one slice Henry IV for BBC television. Lloyd’s programme gives no hint as to this production’s editorial author. One can only assume Lloyd herself had a hand in it. The production does include a long note about Clean Break, the theatre company who have done so much through drama to throw the spotlight on women in prison. This Henry IV, even more than Julius Caesar has the click of prison authenticity about it at every turn. The company never let you forget where the play is being staged and how it relates, coincidentally, to their own lives. Even more than last time, you get the sense of a profound company spirit and of parallel contexts running alongside each other – of political leadership and misrule on the one hand and of prisoners’ competing loyalties against a background of drugs and violence on the other. Individually, you will be hard put to find a more engaging, devious or dangerous Falstaff than Ashley McGuire’s. 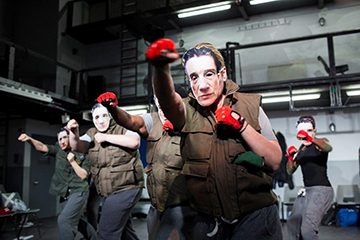 Or a more hotheaded Hotspur than Jade Anouka’s, bristling with (street) attitude – and a pair of flying fists. Lloyd’s production is full of verve, originality and humour. Harriet Walter’s impressive Henry IV, disintegrating before our eyes, is the backbone to several professional debuts, notably Sharon Rooney’s as Lady Percy. Moving, genuine, uncluttered, she stands as a testament to the whole production’s presiding principle of joyful but serious shattering of moulds. Fantastic.